Juliet is one of the most renowned romantic female figures in theatre, so we caught up with Karen Fishwick who is one of the latest actors to take on the role. We discussed how the RSC places Romeo and Juliet in a modern context, the upcoming UK tour, and how she feels about it being broadcast to cinemas across the world! CC: The RSC’s latest production of Romeo and Juliet has been described as a contemporary retelling. Can you tell us more about the play’s new setting and context? Karen Fishwick: It’s modern, but I’d say it’s as if it’s almost a little bit ahead of present times. Our Verona is a very hot, industrial, London like setting, the set is very harsh and metal. It’s almost like our 2018 society in Britain has become just a little bit more undone, as if the seams are coming apart a bit more politically. We’ve kept it very naturalistic, and weirdly colloquial. Even though it’s Shakespearean language, it’s not a huge, grand melodrama. It feels very grounded, and hopefully a lot of young people and teenagers who come to see it will relate to the characters a lot. KF: Yeah electronic music, and we’re all in modern dress. If you imagine a RSC production of Romeo and Juliet you might think of white night dresses, ruffs and rapiers, but we’ve got daggers and flip knifes. We’re keeping it as contemporary as possible. CC: Juliet is one of the most iconic female romantic figures in theatre history. How does it feel taking on such a seminal role? KF: I guess it was quite intimidating to begin with. But very quickly, this had felt like it’s a new piece, which is a very weird thing to say when it’s actually a 400-year-old play. But the way I was hoping to approach it was to rebrand who I thought Juliet was. Even just the word Juliet has connotations, and I wanted to just wipe all of that off the table, and build her up again. Not knowing the play very well, it was like working on a piece of new writing, which was quite liberating. Erica Wilde our director is so generous, and lets you run with ideas, which takes the pressure off trying to make the character what everyone expects her to be. If I do what I believe is right in my heart, and do it with conviction, hopefully it will turn out ok.
CC: So you’re able to make personal decisions about how you portray the character? KF: Totally! I had some ideas before we started rehearsals. Maybe it seems quite negative, but I knew what I didn’t want to do. 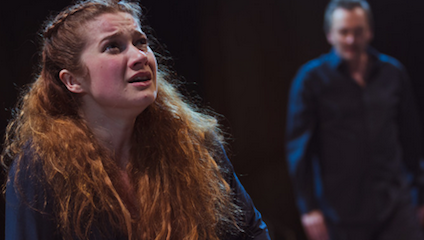 Juliet’s a very repressed young woman and she’s in a society from which she can’t escape. You always see her on the balcony, or at the party, where she looks very pretty and speaks nicely. But I wanted to know; where are her friends? What does this girl do during the day when she’s shut up in the Capulet household? If she doesn’t really see her friends what does she do with all her spare time? She lives in a really dangerous community, so I thought she must have some self-defence classes that she goes to on a Thursday! CC: It’ must be refreshing to create such an in-depth role for a female, as they’re often not written as very 3D characters in older texts. KF: Yes, but I also think that Shakespeare has written such an incredible character. I really didn’t realise that until we were half way through the play. It’s amazing that this man has written about the complex thoughts and strength of a 13-year-old girl so well. She’s extraordinary, she’s much smarter than I am! Before I’d think of her as wishy washy, but she actual has to make really vital decisions in a grown-up world, so it’s an incredible character to explore. It’s a challenge every time I go out to do it, which is an acting gift really, to be able to flex your muscles and your mind every night. CC: And this is your RSC debut! How has it been joining the company? I haven’t done much Shakespeare before really. But it’s been so amazing. The company are so supportive. I didn’t realise how much their nurture young, emerging artists, and introduce people to the arts. They really look after people – especially people with children and families. I never really thought I’d be here, so it’s been really cool to learn more about Shakespeare. I didn’t really know what I was doing to begin with if I’m honest. CC: What is it you like, or find challenging about performing the Bard’s work? KF: Having not done much of it at all, apart from in High School, when you first approach the words on the page you can think “I don’t know what this means! I’m not sure how I’m going to get my head around this!” But breaking it down, and learning the rules of how it all works, it does seem to come back to the same 5/6 staple things. Like not messing around with it too much, you don’t need to change it, it’s just beautiful poetry. It’s also very musical, which I really love. It’s a joy and privilege really to be able to say these words. CC: Are you looking forward to touring the production? KF: I can’t wait to tour. I cannot wait to take it all over the UK, it’s the whole point of our version of the show. The cast is from all over the country, and the play is a melting pot of all these different accents, ages and races, so I’m excited to show people that the RSC isn’t hoity toity, fancy people speaking Shakespeare. It’s actually on the ground, current and relevant to what’s happening. So I really want people to come see it, relate to it, and find it exciting. We do! I’m really proud of the production and I can’t wait to see what the responses are, because every city has got a different personality. CC: And it’ll be broadcast to cinemas on 18 July. How do you feel about being projected onto the big screen? KF: I find it quite terrifying if I’m honest. But I think it’s really cool, I’ve got cousins in Canada who are going to go and see it, which is nice for me personally. And the fact that this play that we’ve made is going to go all over the world, and that we’re sharing Shakespeare is a really cool thing. I would have been all over that if it had existed when I was younger. RSC’s Romeo and Juliet is playing at the Royal Shakespeare Theatre, Stratford-upon-Avon until 21 Sep 2018, and it being broadcast to cinemas on 18 July 2018. It then moves to the Barbican, London from 2 November 2018 – 19 January 2019, before embarking on a 2019 UK tour.